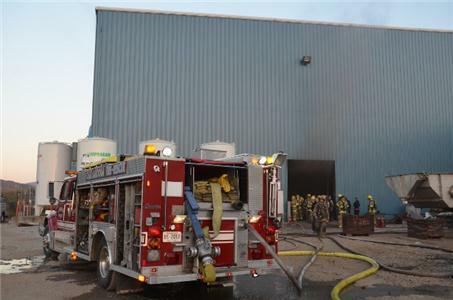 Light smoke coming out the bay door at Designed Alloy Products is the only visible sign of a serious explosion that occurred there earlier this morning. An explosion and fire Friday morning at a foundry in South Chattanooga resulted in 13 workers being injured. At 7:28 a.m., 911 Communications received calls about an explosion at Designed Alloy Products at 3033 Alton Park Boulevard. Eyewitnesses said they were startled by how loud the explosion was, and could see smoke and sparks coming from the top of the large warehouse. The Chattanooga Fire Department responded with six fire companies. Captain Randy Steele with Engine 5 said the fire was located around a large furnace. Workers at the plant advised the firefighters not to put water on the furnace, because it could have made the situation worse. So Captain Steele said the firefighters used several dry powder extinguishers on the furnace and hand-held hoselines to put water on the fires around the furnace. It took the firefighters roughly 25 minutes to get the blaze under control. Thirteen employees at the plant were injured. Three suffered from smoke inhalation, and were treated on the scene. Three other employees were transported by Hamilton County EMS to a local hospital. Lt. Scott Powell with HCEMS said two of the victims had relatively minor burns, but one victim was more seriously injured. Lt. Henry McElvain with the Fire Investigation Division later learned from doctors that the victim had second- and third-degree burns to approximately 10 to 15 percent of his body. He was expected to be transported to a burn unit in the region. Lt. McElvain said his injuries were not thought to be life-threatening. Erlanger officials said Friday afternoon that seven additional “walk-in” patients showed up at their ER to be checked out. Spokeswoman Pat Charles said all were expected to be treated and released Friday. In the meantime, the employee who received the worst burns from the explosion has been transferred to the Burn Center at Vanderbilt Hospital in Nashville for additional treatment. The other two victims originally transported to Erlanger had less serious injuries and were expected to be treated and released Friday. An estimate on the damage from the explosion and fire was not available. Chattanooga police also provided assistance. 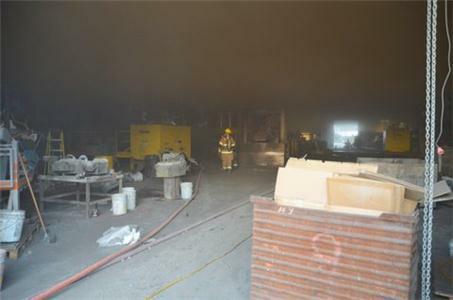 A view inside the plant where the explosion occurred.